Create a design and simulate using EE-Sim® tools: The MAX1709 sets a new standard of space savings for high-power, step-up DC-DC conversion. It delivers up to 20W at a fixed (3.3V or 5V) or adjustable (2.5V to 5.5V) output, using an on-chip power MOSFET from a +0.7V to +5V supply. Two control inputs (ONA, active-low ONB) allow simple push-on, push-off control through a single momentary pushbutton switch, as well as conventional on/off logic control. The MAX1709 also features programmable soft-start and current limit for design flexibility and optimum performance with batteries. 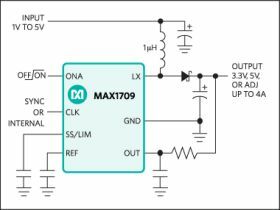 The MAX1709 is supplied in both a high-power TSSOP package, which allows a 10ARMS switch current and a 4A output, and a narrow SO package, which supplies a 2.4A output with a switch rated at 6ARMS. Although the narrow SO device has a lower RMS switch rating, it has the same peak switch current rating as the TSSOP device, and so can supply 4A loads intermittently. 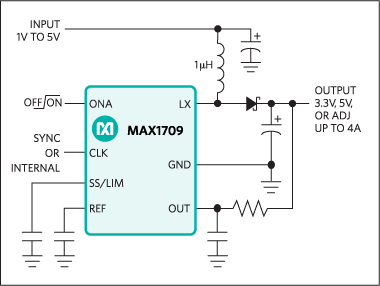 If loads of 2A or less are required, refer to the MAX1708.